CINCINNATI, OH (January 24, 2017) – Seventeen-year-old hippo Bibi gave birth early this morning to the first Nile hippo born at the Cincinnati Zoo & Botanical Garden in 75 years. 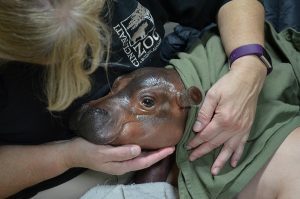 The calf, a female, was not expected until March and is receiving critical care from vet and nursery staff since the premature baby was not able to stand to nurse from mom. 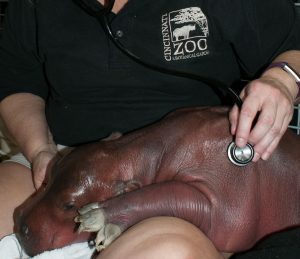 The baby weighs 29 pounds, which is about 25 pounds lighter than the lowest recorded birth weight for this species. The normal range is 55-120 pounds. “She looks like a normal calf but is very, very small. Her heart and lungs sound good and she is pretty responsive to stimuli, but we aren’t sure how developed her muscles and brain are,” said Gorsuch. When Bibi showed signs of labor late yesterday afternoon, Zoo staff performed an ultrasound that showed a major shift in the baby and confirmed that it was on the way. 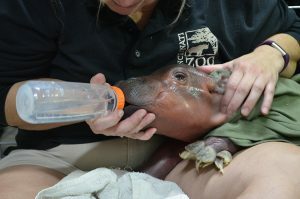 During the procedure, keepers were able to collect milk from her. “We’re hoping to get the baby to drink Bibi’s milk and other supplements from a bottle. We’ll continue to milk Bibi so we can provide these important nutrients to the baby and also stimulate production so she’s ready to nurse when the baby is strong enough to be back with mom,” said Gorsuch. Vets and animal care staff are providing round-the-clock intensive care for the baby in close proximity to Bibi and Henry, the 35-year-old father of the calf. The team is not sure how long it will take to get the premature calf on her feet. That developmental milestone must be reached before she can be reunited with Bibi. This baby made history in utero when Zoo scientists captured the first ever ultrasound image of a Nile hippo fetus earlier this month, confirming that Bibi was pregnant. The Zoo will provide updates on the baby’s condition on its website and on Facebook.